Warning, Text heavy but informative post! I am so thankful to this blog and a crazy idea of making a journal of all the recipes I like coz I tend to forget them, so thankful, it is only as their result that I am getting to be a part of some really nice foodie experiences. Right from meeting new people to meeting "the person" to knowing more and more about Food and Beverage, this seems like the best decision I have taken in a long long time. One such experience which I was rewarded with was a special Wine Tasting organized by Four Seasons with their special wine connoisseur Shamita Singha, held at the very popular and amazingly beautiful Neel (Formerly Tote on The Turf), owned by Rahul Akrekar from the very popular Indigo fame. I was super excited about this event right from when I received an email asking if I was interested to attend and hey Wine is something I love, you love, everyone loves! But deep down inside most of us do not know how much more there is to a Wine than what meets the eye. Let me start off with how the day went. I traveled by the Mumbai Local for the second time thanks to Desh who was kind enough to give me company (Believe me I would not have had the guts to do it without you) and traveling in the Gents compartment with all those stares, wow. It was quite an experience in itself. But with the non stop banter we missed our station and had to get off at the next one and then a cab to the Mahalakshmi Race Course, which looked greener and more beautiful thanks to the Monsoons. We got off the cab and entered the wrong street but thanks to our true blue foodie noses and our amazing olfactory senses we tracked the fragrance to the back of Neel's kitchen. With a proud smile plastered on our faces and conversations about Kitchen Confidential we entered Neel, which is as picturesque as picturesque restaurants get. Call it just pure luck or whatever, but the perfect setting was hugely due to the amazing weather outside. Four Seasons is a new kid on the block for Indian Wines, and their Winery is situated in Baramati, the Western Ghat region of Maharashtra which is favorable for the growth and storage of wine. Have a look at their awesome looking Winery and as far as I go, I am definitely going to visit their Winery with the man, for it sounds like a really nice couples getaway. Their main style is inspired by the French style of wine making, and their equipment is all imported from Italy. Shamita was open to answering and discussing everything about wines. We spoke a lot about what kind of food should be had with what kind of wine. Especially because we usually have our wines either by themselves or with the traditional continental fame. But we are mostly lost when it comes to pairing wines with Indian Food. Something spicier on our palette. How would that be? The rule of thumb to be followed here is that a food and wine pairing is ideal when you are able to taste both the food as well as the wine without overpowering each other. I have had meals in the past where I had Chicken Tikka with Merlot and believe me after the first sip of my wine post the Chicken, all I felt was a thick coat of nothingness on my tongue and was barely able to taste any flavors at all. A big no no. Wine Colour: For white wines, the paler the wine, the younger it is. White Wines that have been aging are paler in colour. As far as the Reds go, the older it is, the lighter it gets. Younger Red Wines are darker and fruitier and have a lot more tannins, which is the aftertaste which you get after you eat a tart fruit like a Jamun or Lemon. The Red or Pale colour does not come from any additives, as we all know that the grape juice is in fact transparent. But this colour is imparted by the skin of the grapes which are in contact with the wine during fermentation. For lighter colored Reds like a Rose Wine, these skins are removed after reaching a desired colour. The mantra is simple. Follow the 4 S method. SEE the wine. Tilt your glass and see if there is a nice and clear liquid with no signs of cloudiness. SWIRL the wine. You do this so that the flavors and aromas inside the wine glass are released.Open up the bouquet of the wine, exposing the beautiful medley that you are about to dig your nose into. SMELL the wine. Dig your nose deep into the glass and smell the wine. Look for what fruits you're getting. White wine mainly smells like tropical fruits while Red smells more like berries. This is not because they are added to the wine. They're just the molecules. SIP the wine. All the mumbo jumbo is done. Sip the wine, don't swallow immediately. Let it roll around on your tongue, taste the flavours and enjoy them before you gulp it down :) Simple right? Another note: Remember the last time you ordered wine at a restaurant and the server came along and asked if you wanted to taste it before he poured you a glass? Well, that is not because he wants you to taste the wine. Well, not just taste, but you have to execute the 4 S system there to check if the wine being served to you is right or not. If not, return the bottle and a fresh one shall be opened. Storing and serving the Wine: Wines with Corkscrews are best stored horizontal. You have to make sure that the wine should be touching the cork, since it's made out of natural material and will start decaying n growing fungus if not in contact with wine the whole time. Wines with caps can be stored vertical. Wine enthusiasts store wines in cellar fridges. But since I have none so people like me should ideally pop Red Wines in for 20 minutes or so before serving, or maybe in an ice bath, so that the temperature is between 16-18 degree C. Another good way to chill Red Wine is to wrap it in a wet towel and place in front of the Air Conditioner vent for 20 minutes. For White Wines, the optimum temperature is 6-12 degrees C. Warmer than our refrigerator. So maybe 40 minutes in the fridge would do it. Cooking with Wine: I have been the kind of girl who would use cheap wines or stick to Port wine while cooking. But as Shamita says (and I kinda agree) it will only taste as good as the wine is, coz basically we burn off the alcohol and what stays is the actual wine flavour. So I will try not to be stingy the next time I am cooking with Wine! We started off with The Four Seasons Chenin Blanc, a beautiful young White Wine. This was paired with Aloo Panch-Foran (Sigdi BBQ'd Baby Potatoes marinated in Mango Pickle) and Murgh Nawabi Tikka (Tandoor roasted, yoghurt marinated Chicken). Both the wine and the food complemented each other beautifully well. I could taste the amazing aromatic aftertaste of the Aloo as well as the Chicken along with the Wine. We then moved on to a Rosé Wine from Four Seasons called the Blush (what a cute name) which was paired with Bhoona Paneer Kathi Roll and Tulsi Patte Ka Jhinga (Tandoor cooked, Holy Basil flavoured Prawns. Also, best dish of the day). This was a slightly rounder tasting wine with light berry notes and would complement very well with Seafood and lightly spiced dishes. I love my Reds more than the white so the next course was my favorite. Four Seasons Shiraz served with Peshawari Paneer Tikka (Crushed Spices rubbed Paneer, Tandoor cooked) and Bhoona Gosht Kathi Roll. The wonderfully fruity and deep Shiraz totally went with the hit of the spice and cleansed the palette while we reached out for the next bites. Lovely to go with more complex flavored dishes such as masala based gravies as well as Biryani. The last course was The 2009 Four Seasons Special Barrique Reserve Shiraz which was served with Kesari Khumb Tikka (Another dish of the day for me, Saffron marinated Tandoori Mushrooms) and Lucknow Seekh Kabab (Sigdi cooked, coarsely ground Mutton Seekh). We got to compare this last course with both types of Shiraz and we noticed that the Reserve Shiraz had less tannins and tasted smoother, oakier and more mellow even though it was higher on flavour. This would totally go with heavily spiced dishes. The colour of the 9 month old Shiraz Reserve was also a shade lighter than the regular one. After many happy chit chats and fruitful discussions later I realized that I was buzzing a little and needed to get home. But not before dessert. They served us Rabdi Kulfi which was the least impressive of all the things served in my honest opinion. It was a little icy. But yummy nonetheless! Shamita and Four Seasons gifted us with a bottle of Blush each which now sits in my bar and shall be opened up next weekend for drinks night with the family! Met some lovely people, here are their blogs. Thanks Akshay for the invite! Was lovely meeting up with you guys! As you said, it was a fun, educating evening! You have encapsulated the evening in your post beautifully! Also why dont you enable logging in through FB or Twitter?? Sounds like you had a great time! 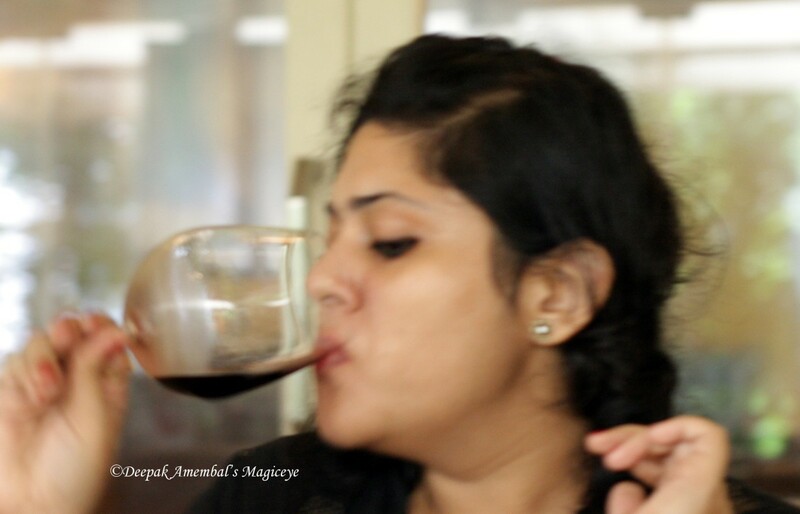 Very informative post and now I know whom to turn to for wine pairing gyan! @Magiceye Pleasure is all mine :) Thanks for liking the post! @Desh I could not miss out on the awesome train experience since it was only my second time! :D And yes I should add Twitter and Facebook to my blog. Good idea! Super like. And what a day!? Beautiful wines and beautiful company. Time well spent. Unquestionably believe that which you stated. Your favorite justification seemed to be on the web the simplest thing to be aware of. I say to you, I definitely get irked while people consider worries that they plainly don’t know about. Buy you are good!